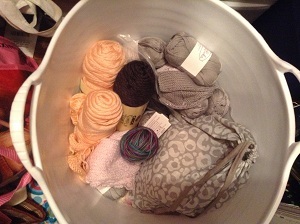 4KCBWDAY4 – My favorite colors for knitted projects seem to be grey. Grey (I actually just googled “grey” to see if it was actually supposed to be written “gray” and apparently they’re both correct…depending on the continent I guess. The U.S. writes it as “gray”, but in honor of all of my UK followers, this one is for you ::wink, wink::) is my favorite color and I have bought a few good skeins of grey wool. I have knitted two baby sweaters in Sheppards Wool in grey and one of those with a super dark navy collar (see my first few posts). I tend to generally like more “less fun” colors like grey, black, navy and maybe, just maybe I may have a earthy-heathery-neutral tan color in my wish list on knit picks. ha! When I think back to the projects I made in the past, I think of the pretty baby things I have made: a grey and white diagonal baby blanket (my actual first project other than the learn-to-knit-yourself-a-scarf scarf), a few pink and purple baby sweaters, some pink/purple cotton drawer sachets…etc. I see a pattern with me knitting in pink…this color would never be for me. Some of these fun, girly whimsical colors are all for gifts. 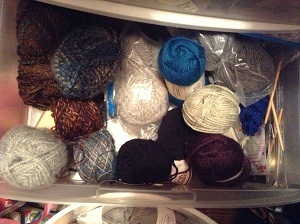 When I look at my stash I see a lot of acrylic crap that I stockpiled in excited when I first learned to knit three years ago. UGH. I actually can’t stand knitting with that stuff and so it has just been sitting and sitting in my closet and bins for quiet some time. Occasionally, very once-in-a-blue-moon occasionally, I pull it out and look for a pattern on Ravelry for a gift for someone or just to try to get something on my needles out of boredom and not having the money to buy the “nice” stuff. 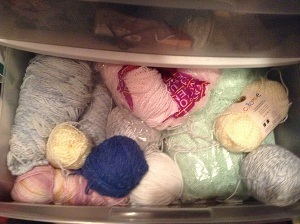 *This is my cotton drawer. I also keep my buttons and a few finished dishcloths and even my sons linen beach (market) bag (navy) in here. *This is my “baby” drawer. 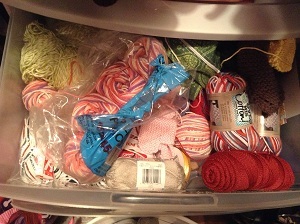 This is also the drawer where *most* of my acrylic new-knitter-goes-crazy purchases come to die. 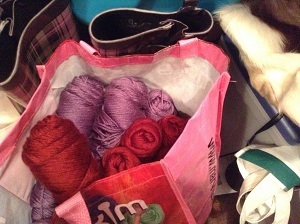 *Last one is my bag of purple and red Caron mill end bag of yarn. Yes, while it’s nice, It’s not exactly inspiring me for a sweater in this purple or a blanket of both colors. This is also the bag that holds my extra bags (lol). There is my deer fur bag on the right hand side and some rain boots. (Sorry my purses and shoes live in this closet as well). 4KCBWDAY5 – I don’t really understand what the instructions mean when they say find a way to blog in a different style. hm. nope. moving on. 4KCBWDAY6 – This will be fun to write about! My favorite knitting tool is FOR SURE, HANDS DOWN, my Knitters Pride Dreamz Symfonie interchangeable needles http://www.knitterspride.com/Materialwise-size-Details.asp?id=4 . I use them for every project. and I love, love, love the variety of wood colors that match each needle size. It is easy to find bc each needle size is its own color. Knit picks needles, which I thought actually about buying instead, are the same color way for each neede size…god forbid you don’t have a ruler/needle hole thingy with you. One last bonus about the Dreamz needles is…they fit the 16″ cable. I got the 16″ special size set so I can make hats on the 16″ set or use the 32″ cable for sweaters or blankets without even blinking an eye. SWEET! 4KCBWDAY7 – Where do I hope to be for the 5th Annual Knitters Blog weeK you ask? Well, by this time next year, I hope to have 100 *wordpress* followers on my blog and that my own website will be up and running. I think I will have honed in on my attachment to projects and not let them get the best of me (I mean seriously, sometimes I get so frustrated that I don’t pick up needles for days or weeks…). I hope to have conquered knitting toe up socks like a champ (yes, I’m giving you the stink eye Mr. Judys Magic Cast On and Mr. Turkist Cast On) and I hope will have made a stuffed animal like a cat or bunny from my Ravelry favs. I want to set myself realistic goals so that I am setting myself up for success by this time next year.